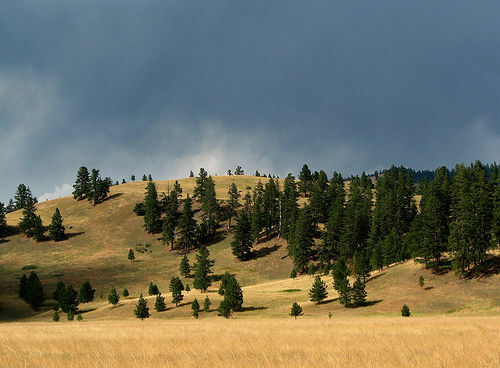 This incredibly scenic and varied route across Montana allows for a leisurely and fascinating day along the trail. This area is called “The Blackfoot Challenge” by the cooperative of local communities that have organized to protect the Blackfoot Valley watershed. The drive parallels the Blackfoot River and cuts through the heart of the territory once ruled by the Blackfoot Indians (who call the river Cokahlah-ishkit). For Lewis and Clark buffs, its significance is that it also parallels Meriwether Lewis’s return journey through Montana in 1806. For modern-day travelers, a delightful and leisurely drive in Lewis’s footsteps begins with mountains and pines near Missoula. This is the Montana of “A River Runs Through It.” Lewis and his party followed an old Indian road known to the Blackfoot as “the road to the buffalo.” Eventually, it led to the Great Falls and the yellow, rolling hills where the Indians converged for hunting season. Montana 200 closely follows this old route. The Prairie of the Knobs. Photo by Bitterroot. Three days out of Traveler’s Rest, Lewis came upon one of the most interesting landscapes on the entire Lewis & Clark trail, a place he named “the prairie of the knobs.” Here Lewis described a barren landscape studded with lumpy glacial mounds. The surrounding landscape contained a wide variety of birds and many animals, from antelope and deer to “burrowing squirrels” (known to us as Columbian ground squirrels). On our trip, we didn’t see any of those, but at a dusty rest stop, we did see a hobo spider. More to the point, Mary saw it drop on my back from above and make tracks for my neck. She acted quickly to save me from what would have been a scary bite! It made me wonder what instances of extreme screaming Lewis & Clark failed to record in their journals. A very pleasant stop on “the road to the buffalo” is the small, bustling town of Lincoln. Lincoln had its day in the media spotlight back in 1996, when the pathetic figure of Ted Kaczynski, the murderous “Unabomber,” was hauled out of a cabin where he was living as a hermit. Lincoln has a lot to offer a tourist loafing along Highway 200, including a big souvenir trading post (where Mary found one of her best all-time Lewis & Clark t-shirts) and a lunch spot called Ponde Roses’s where we got great BLTs. From Lincoln, you head towards the Continental Divide through incredible timbered mountains. We climbed and climbed into the spectacular and beautiful heights with hardly another car or person in sight. It was easy to imagine the Blackfoot still roaming this land and wish that somehow we all could have found a way to live together. 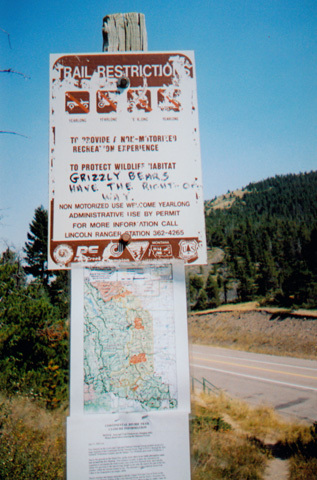 On July 7, 1806, Lewis and his party crossed the Continental Divide at a rugged spot now called Lewis & Clark Pass (though Clark never saw it). From the pass, Lewis had a spectacular view all the way to the Great Falls area and the landmark Square Butte. Even today, the faint marks of Indian travois poles can be seen etched in the prairie soil, and back then it must have been a sight to both thrill and slightly terrify the explorers. 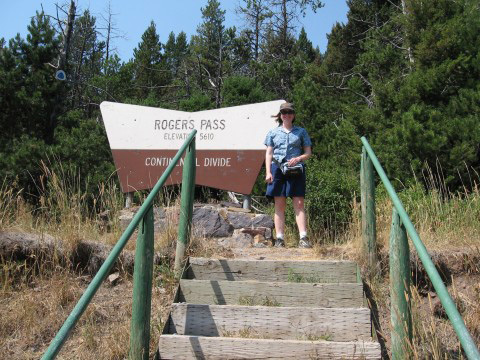 Lewis & Clark Pass is just one pass along the “Great Divide” which separates the waters that drain into the Pacific from those that drain into the Atlantic and Gulf of Mexico. It can be reached via a three-mile hike/climb, which we were not equipped to undertake. Highway 200 crosses the Divide at another spectacular spot known as Rogers Pass, chosen as the highway route because it is 800 feet lower than Lewis & Clark Pass. Haze and the smell of woodsmoke from nearby wildfires was obvious here and off and on for the rest of the day. Rogers Pass made history on January 20, 1954, when its weather station recorded a temperature of -70 degrees — the coldest temperature ever recorded in the continental United States. Rogers Pass is in a wilderness area noted as one of the last strongholds of the grizzly bear. When you go hiking in an area with grizzly bears, be sure to make noise by attaching tiny bells to your clothing, and watch out for grizzly bear poop. How do you recognize grizzly bear poop? It’s full of tiny bells.